Steve Gordos shows the Hall of Fame book inscribed with Billy Harrison's name. Relatives of new Wolves Hall of Fame inductee Billy Harrison have been traced – thanks to some local newspaper publicity and prolific author Steve Gordos. Efforts to track down surviving family members of the early 20th century winger in time for the recent gala dinner at Molineux proved unsuccessful. 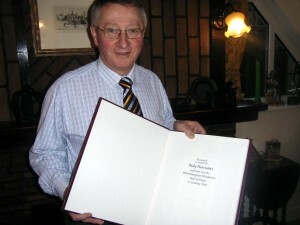 As a result, the handsome bound book marking the player’s induction was handed for temporary keeping to Steve, who also spoke on stage with MC Bob Hall on the night about the man who played 345 matches for the club. But the valuable keepsake is now destined for a more appropriate, long-term home after an article in the Black Country Bugle had the desired effect. “I’ve been quite happy to look after the book because it’s a lovely souvenir, inscribed with his name, and containing countless reports of Wolves games and major events,” said Steve, who is a member of the Hall of Fame selection committee. “But it really should be in the Harrison family and I was thrilled to hear that a relative had come forward after the Bugle did a nice piece. “Billy’s great grandson, a Wolves fan from Derby called Peter Chesney, was apparently surfing on the Internet for information and stumbled across the article. “He has now made contact and I believe plans are being made for Wolves to officially hand the book over to him at one of the forthcoming matches. Dorset-born Peter, 31, has been a Wolves supporter for about 20 years and said: “I became a fan as soon as I was told about my great granddad. 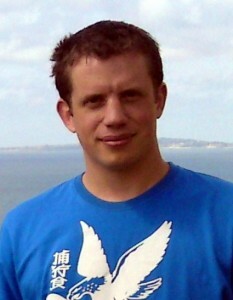 Peter Chesney, Billy Harrison's great grandson. Remarkably, in a development that would have headline writers drooling these days, Harrison’s wife gave birth to triplets on the day he played and scored for Wolves in their 3-1 FA Cup final win over Newcastle at Crystal Palace in 1908. The player subsequently moved to Manchester United, Port Vale and Wrexham and also ran the Rose and Crown pub in Tettenhall before he died in 1948, aged 62. The brief statistics and facts relating to Harrison’s career appear on this website as he is no 23 in the list in our Legends area. Posted on: Tuesday, March 2nd, 2010.